​Connecticut’s Beardsley Zoo’s New England Farmyard has welcomed two delightful new residents. 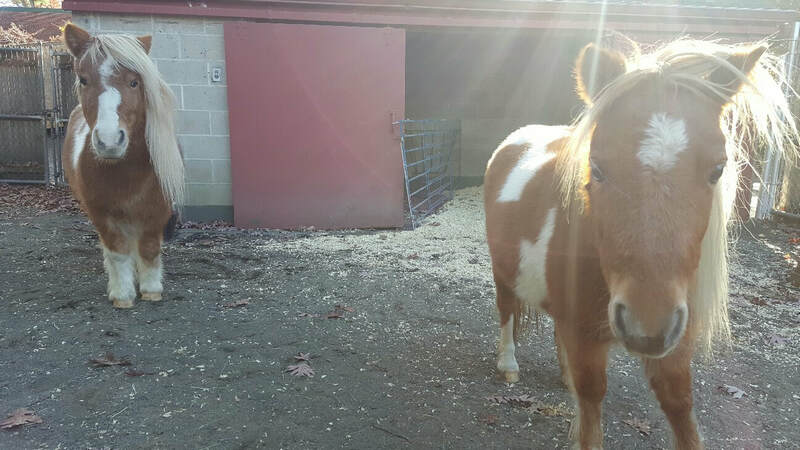 Two Miniature Horses have joined us from a rescue situation in Vermont. Nutmeg is a male and Caramel is a female. They were both born in 2008 and they are 9 hands (36 inches) tall. The height of all equine species is measured in “hands”. One hand equals 4 inches. Equine height is measured at the withers (the top of the shoulders where the mane ends). 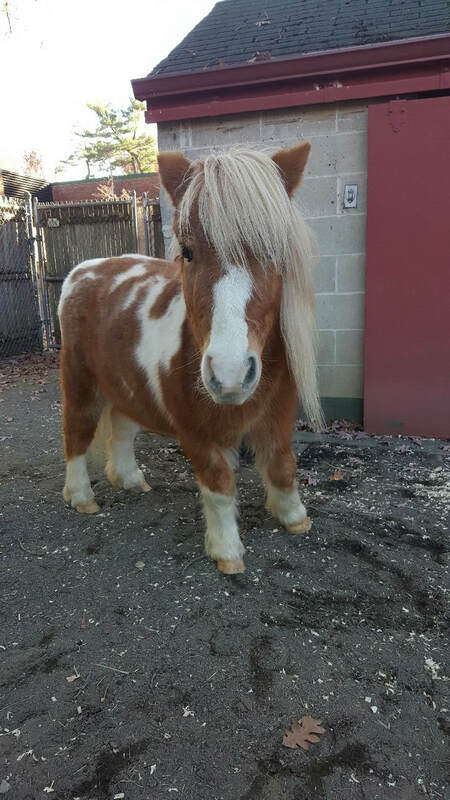 A Miniature Horse is shorter than the smallest pony yet they have the same proportions as a full-size horse except for their eyes. DESCRIPTION: Miniature Horses look exactly like regular horses only much, much smaller. Their body proportions are the same. The one difference in proportion is their eyes. Miniature Horses have large eyes. Miniature Horses are mammals. They have some of the largest eyes amongst mammals. Their eyes can give them 360 degrees of vision. Although they are small they are quite strong. They have dainty hooves that are made of the same protein as human hair and fingernails. Their nose could fit into a person’s hand. A small child will be eye level with a Miniature Horse. Full-grown Miniature Horses weigh between 150 and 250 pounds. The tallest they can grow and still be considered a Miniature Horse is 38 inches. Foals will reach 90% of their adult height by the time they are one year old. Miniature Horses come in a wide range of colors and patterns. In the warmer months their coat is thin to allow them to keep cool in the heat and humidity. In colder months their coat gets thick and wooly. One interesting thing about Miniature Horse hair is that it naturally repels fleas. Miniature Horses have excellent senses of sight, hearing and smelling. They can turn their ears in different directions to give them better hearing. They breathe through their nose but not their mouth. On average, they sleep 2 ½ to 3 hours a day and they sleep longer in summer than they do in winter. Male Miniature horses have more teeth than the females. Miniature Horses prefer to be outdoors. They like to graze in pastures but they also need a barn stall for when they want to get out of any bad weather. Miniature Horses are known for their gentle nature and fondness for human companionship. This had lead to some Miniature Horses being trained as guide and service companions. DIET: Herbivore – They eat grasses and grains, hay, oats. They also need a daily source of salt and minerals. FAMILY LIFE: A female, or mare, usually gives birth to one foal every Spring. A newborn foal weighs about 20 pounds and stands between 16 and 21 inches tall. Soon after birth the foal is standing on its own four feet and within a few hours it can be running across a pasture. Foals will stay with their mother for up to a year but they are weaned at around four or five months of age. The father, or stallion, takes no part in the care of the offspring. LIFE SPAN: The average life span is 30 years in the wild or in human care.